This example uses the SUBGROUP= option to display the same statistics as displayed by Examples 1 and 2. Similar to Example 1, this example shows the total sales for each of the three geographic sites. The relative thickness of each bar represents the number of salespersons at each site. 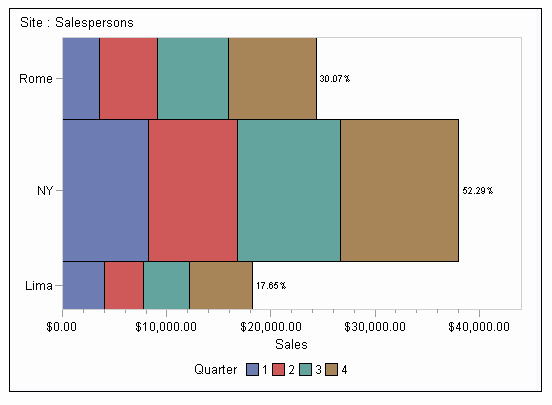 The addition of subgroups to this chart shows the relative percentage of sales for each quarter. This chart demonstrates that all of the sites had most of their sales posted in the fourth quarter. Run PROC GAREABAR with an HBAR statement. The HBAR statement creates a horizontal bar for each value of SITE. The SALESPERSONS variable sets the width of each bar. The SUMVAR=SALES option sets the length of each bar. The WSTAT=PERCENT option displays the width statistic as a percentage, which enables you to compare the distribution of salespersons for each quarter. The SUBGROUP=QUARTER option and the RSTAT=SUM option are reflected in the statistics that are displayed as absolute numbers along the horizontal bar.